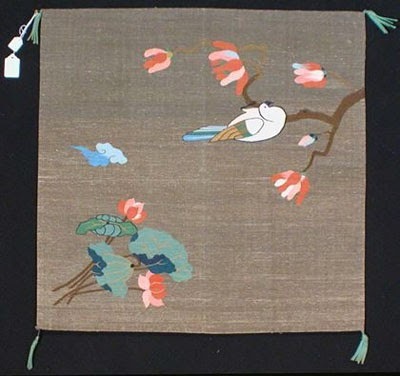 Fukusa 袱紗 is the name of a small square silk crape wrapper cloth made of two sheets, used in the tea ceremony to put utensils on it or gently wipe them with it. It is also used to wrap money presents for ceremonies. Sometimes the family crest is embroidered into one corner. For men, the color is often purple, for women red. Sometimes called "small furoshiki wrapper". 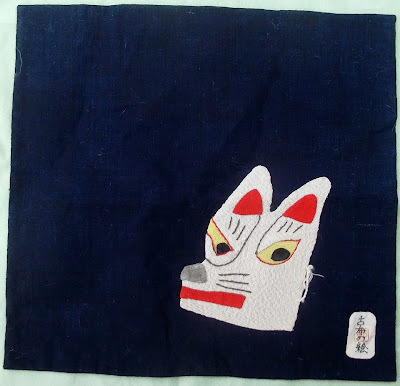 In cooking, the word FUKUSA ふくさ　indicates something where two things are put together or blended together like the two sides of a fukusa cloth (futatsu o awaseru). cotton indigo cloth with a kitsune applique. Even though it is cotton, I think it was someone's specially handmade dashibukusa and not a fukusa, but the size is similar and the stitching is folded. a blend of two types of miso paste, also called awasemiso (合わせ味噌 (あわせみそ). Light and dark paste is often blended for a special taste effect. A kind of sushi where the ingredients with the cooked rice are wrapped into a thinly cooked square Japanese omelete. The square package is then wrapped with two stripes of konbu seaweed and mitsuba honewort. In this case the naming bings out the soft touch of the food. A leafy vegetable with three leaves on each stalk, hence the name. The tender stalks are usually used for cooking. The leaves can also be chopped up and added to the daily miso soup. mitsuba belongs to the family of dropwort, Japanese parseley 芹 (せり). It has been used in Japanese cooking since olden times. According to the way it is grown, ther are two main types. It contains a lot of vitamin A and C.
The leaves do not keep well and should be kept in the refrigerator to use soon. They are used as flavor for soups and donburi. They should never be heated but are added after the meal is cooked. ne mitsuba 根三つ葉 ねみつば "root mitsuba"
They are sometimes grown whith the roots and most of the plant covered with earth, so that direct sunlight does not get to the plant and keeps the stalks white. The roots can be eaten in kinpira. Kinpira goboo きんぴらごぼう is a common dish. Carrots and burdock are stir-fried with salt and sugar. ito mitsuba 糸三つ葉 いとみつば "thread mitsuba"
They grow in close lumps and the stalks are very long. Often they are grown in water and can be harvested all year long. Two stems are blanched in hot water, then they are rolled and folded. This preparation is used for soups and chawan mushi. Mitsuba Aoi 三つ葉葵 is the hollyhock crest of the Tokugawa clan.